Jennifer Cao is planning a career as either a physical therapist or a cardiac rehabilitation specialist. No matter which path she chooses, however, the senior kinesiology major from Glendale Heights, Illinois, can deliver a powerful motivator to her future patients: personal knowledge of the determination of Olympians and Paralympians. Cao was one of a dozen select students from the Department of Kinesiology and Physical Education (KNPE) who traveled in May to Colorado Springs, Colorado, thanks to the NIU College of Education’s Engage U.S. program. Recently added to the Educate and Engage Program, it’s tailored to students who are not teacher-licensure candidates. Thanks to generous funding from donors to the college and the department, students paid almost nothing. 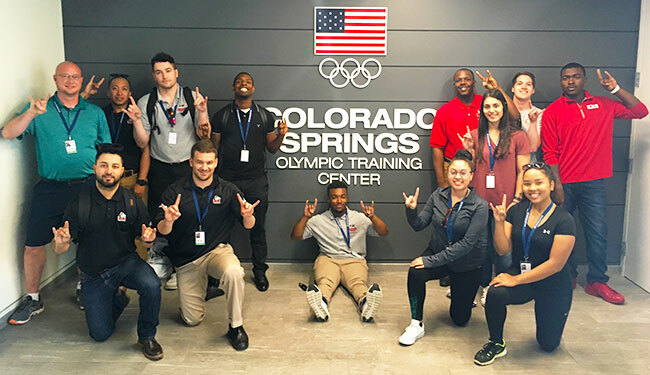 During four days and nights at the U.S. Olympic Training Center, the students toured world-class facilities, learned about U.S. Olympic operations, attended presentations given by athletic trainers and sport medicine. Before they reached their main destination, they had the opportunity to visit the Nebraska Athletic Performance Laboratory at the University of Nebraska-Lincoln; while in Colorado Springs, the students also toured the U.S. Air Force Academy’s athletic facilities. KNPE instructor Brandon Male, who supervised the travelers along with KNPE Assistant Professor Peter Chomentowski, says that many of students came home with “eyes open” and “a more clear direction” for life after graduation: “They’ve seen the very top of sport now,” he says. “Educationally, this was the coolest experience I’ve ever had in my life – from start to finish. It was great to see the facilities and to meet the people, but the best part for me was getting to see the impact on my students,” says Male, organizer of the trip. At the Olympic Training Center, the NIU delegation toured and worked out in the facilities; heard presentations on sports performance, sports medicine and nutrition; and learned the history of Team USA, which included permission to handle gold medals and Olympic torches. Recent graduate Michael Belbis, who earned his master’s degree in exercise physiology and fitness leadership this spring, jumped on the chance to participate in Engage U.S.
“Because I plan on going on to a Ph.D. program, I thought that seeing how elite athletes were made was a good way to further my toolbox of knowledge on sport performance,” says Belbis, a native of Burbank, Illinois. He appreciated every opportunity to ask questions. Cao, who switched her major to kinesiology from biological sciences in her sophomore year at NIU, also probed the Olympic Training Center brains for career advice. “I wanted to see what my passion was all about, and there were so many interesting things to learn. What really helped me was asking a lot of questions,” Cao says. Not every moment was spent absorbing facts and knowledge, of course; a side trip to the Garden of the Gods gave the NIU travelers a chance to “get up on a mountain,” Male says. Meanwhile, the group enjoyed the run of the Olympic facilities. But the hands-on learning is what the students will remember most, Male says. Other students on the trip were Kimberly Fields, Jacob Hurwitz, Aaron Mittman, Christopher Orange, Kenneth Riley, DeVonte Robinson, Christopher Triplett, Joseph Veljkovic and Nicholas Waite. “It was great for them to hear about how these professionals currently with Team USA got there. Many of them were very surprised to find out that, not many years ago, these Team USA sports medicine professionals were recent college graduates looking for internships,” he says.